Льдогенераторы купить в Алматы. Льдогенераторы заказать по выгодной цене - Uni-Tech. Фото, описания, характеристики, отзывы. Доставка по Казахстану. 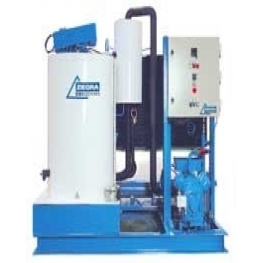 The Ziegra SWE 750TW makes 750kg per 24 hours of fresh water flake ice or 600kg per 24hrs of salt water ice. It is available in both standard UK and tropical versions. Ice from saltwater or freshwater. 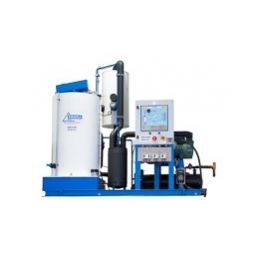 The SWE 750 ice machine will be delivered according to CE standards and ready for connection to water power and drain. 3 min. overrun to use the re-evaporation after switch off. Switch off by light scanner or light barrier when ice receptacle full. Ice discharge type L: Ice discharge by flexible hose, level control by reflection sensor. 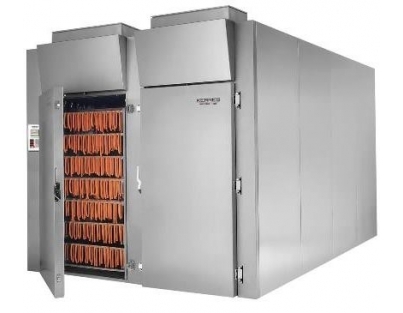 Standard option for all SWE models, the flexible tube can be routed into other compartments. In order to avoid blockage it is advisable to maintain a fall over between 35 and 45deg from horizontal. Suitable for freshwater and saltwater. State dimension X when ordering. Ice discharge type K: Ice discharge by rigid pipe, level control by light barrier. Optional for all SWE models, the rigid pipe drops vertically down to discharge ice below the machine position. Suitable only for freshwater. State dimension Y when ordering. Frostguard: The machine equipped to deal with intermittent temperatures below 5°C, only available in conjunction with remote condenser option above. 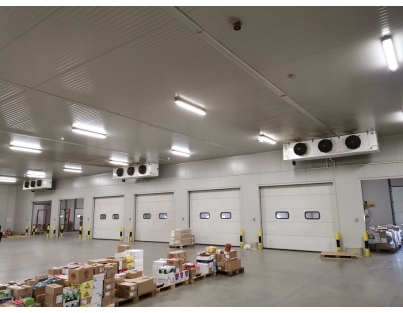 Cold installation pack: Extra insulation and heater for installation in a coldroom below 5degC. Only available in conjuntion with remote condenser option above. Painted pipework: Refrigeration pipework painted, required when machine will be located in areas exposed to ammonia in the atmosphere. Poly ice shovel: One piece moulded ice shovel in white for the hygienic and rapid removal of ice from boxes, bunkers and bins. 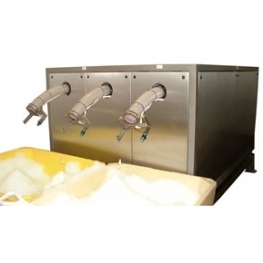 The Ziegra ZBE 750-SG500 ice machine makes up to 750kg per 24 hours of flake ice in one of three sizes. It is available in both standard UK and tropical versions. The machine is mounted on a 500kg slope fronted ice storage bin. Granular flake ice made at optimum temperature of -0.5°C. Three sizes of ice flake available: micro, midi or macro. External water filtration system supplied as standard. 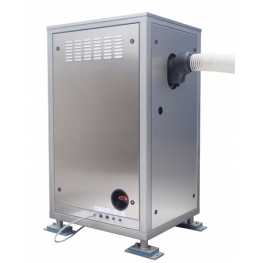 The ZBE 750-SG500 ice machine will be delivered according to CE standards and ready for connection to water power and drain. The bin mounted on castors so the machine can be moved for cleaning. Comes pre-fitted to the bin. Water cooled instead of air-cooled: where air-cooling is not possible.Useful in applications where the machine must be installed into an area with poor ventilation where a remote aircooled condenser is not possible. 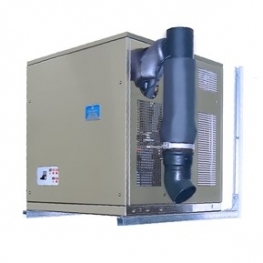 Remote condenser option: The condenser supplied separately to the machine for remote mounting, typically outside, when the machine is to be located in areas that poorly ventilated or have airbourne contamination such as flour dust. Available as standard for indoor mounting, weatherproof for outside mounting and cu/cu saltwater resistant for mounting in areas close to the sea. Low noise condenser: Only for remote installation. Use when the condenser will be going in an area sensitive to noise, such as residential. The machine equipped to deal with intermittent temperatures below 5°C, only available in conjunction with remote condenser option above. The water tank automatically drains when the machine is switched off, preventing water stagnation during periods of infrequent use. Auto flushing of system with water, includes auto water drain. Details on request. 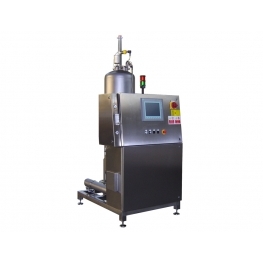 Sterilization of the incoming water supply by mean of UV filter, all incoming water is passed through a powerful UV field on its way into the machine which kill almost all biohazards in the water supply. 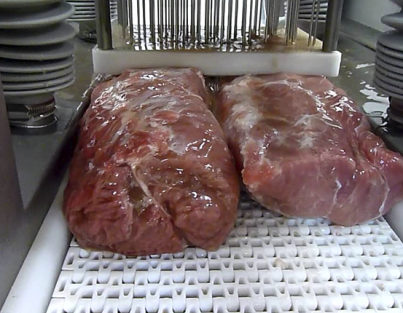 Slows down proliferation of water-borne bacteria inside the machine during operation. Spare filter cartridges: Set of replacement cartridges for the Ziegra triple kit that comes as standard with this machine, The fine and coarse cartridges require change every 6 months, the anti-scale when it runs low. Order part ZUK9700031KIT. 1 x ZUK9700031 - Fine filter. 80kg capacity insulated ice cart, moulded from food safe polymer for maximum hygiene. With removeable lid. Ideal when the ice machine and bin must be located away from the point where the ice will be used. Allows programming of the machine to make ice at specific times of the day or night. GRP plantroom: A standalone GRP plantroom to protect the ice machine from the elements and thieves when the machine must be mounted outdoors. Arrives fully assembled, needs only a suitable base to bolt it down to. Only available with remote condener option above. One piece moulded ice shovel in white for the hygienic and rapid removal of ice from boxes, bunkers and bins. The Ziegra ZBE 750-BK400 makes up to 750kg of flaked ice into a 400kg elevated bin ready for use and features two 80kg capacity ice carts docked below the bin. The carts are filled by gravity by pulling a lever just above the cart, thus eliminating shovelling of ice from the bin. The ZBE 750-BK400 ice machine will be delivered according to CE standards and ready for connection to water power and drain. The Ziegra ZBE 750-BK200 ice machine makes up to 750kg per 24 hours of flake ice and stores it ready for use in a 200kg elevated bin. A cart plugs in underneath the bin and ice is falls into the cart when a lever is pulled, eliminating manual unloading of the ice from the bin. The ZBE 750-BK200 ice machine will be delivered according to CE standards and ready for connection to water power and drain. 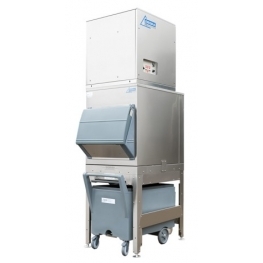 The Ziegra ZBE 750 ice machine makes up to 750kg per 24 hours of flake ice in one of three sizes. It is available in both standard UK and tropical versions. The ZBE 750 ice machine will be delivered according to CE standards and ready for connection to water power and drain. Ice discharge by flexible hose, level control by reflection sensor. Usually used in conjunction with wall brackets or support frame. Standard option for this model, the flexible tube can be used to fill ice carts and can be pushed through a wall. In order to avoid blockage it is advisable to maintain a minimum 22° fall from horizontal. Ice discharge by rigid vertical pipe, level control by light barrier in the top of the pipe. Usually used when machine is sat directly on top of an ice store. No cost option for this model, the rigid pipe drops vertically down to discharge ice below the machine position. Ice discharge by rigid vertical pipe, level control by light barrier in the bottom of the pipe. Usually used when machine is filling an ice cart. Ice discharge by rigid vertical pipe, level control by light barrier in the bottom of the pipe. Usually used when machine is discharging ice through a wall. 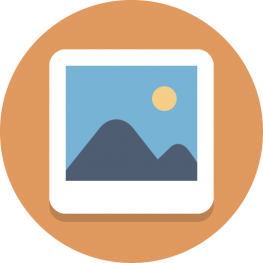 State dimensions X + Y when ordering. A pair of stainless mounting brackets to mount either the ice machine or a remote condenser on a wall. 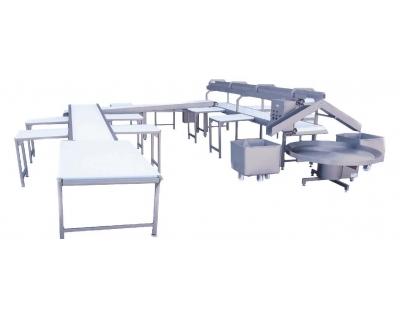 Allows the machine to be mounted at a convenient height for filling ice carts/bins. Stainless support frame: A frame to raise the ice machine to a more convenient working height, useful when the machine is to be floor standing. 90cm and 110cm with drain available. The picture shows the 110cm model with ice cart, not included. 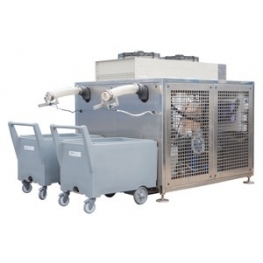 Remote condenser option:The condenser supplied separately to the machine for remote mounting, typically outside, when the machine is to be located in areas that poorly ventilated or have airbourne contamination such as flour dust. Available as standard for indoor mounting, weatherproof for outside mounting and cu/cu saltwater resistant for mounting in areas close to the sea. Extra insulation and heater for installation in a coldroom below 5degC. Only available in conjuntion with remote condenser option above. Set of replacement cartridges for the Ziegra triple kit, requires change every 6 months. 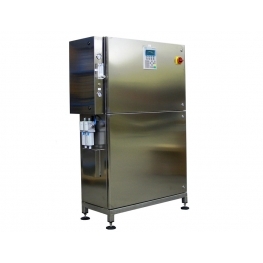 Smartcart 240: 80kg capacity insulated ice cart, moulded from food safe polymer for maximum hygiene. With removeable lid. Double walled polyethylene containers with expanded foam insulated core. 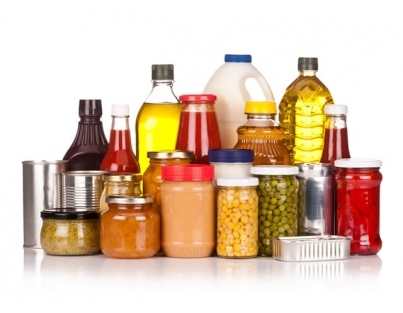 Made from food grade virgin USDA/FDA/EU approved polyethylene. PU filled and UV stable, strong and durable stackable design for space saving. A standalone GRP plantroom to protect the ice machine from the elements and thieves when the machine must be mounted outdoors. Arrives fully assembled, needs only a suitable base to bolt it down to. Only available with remote condener option above. 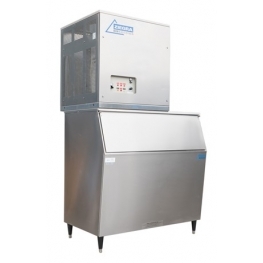 The Ziegra ZBE 750-SG300 ice machine makes up to 750kg per 24 hours of flake ice in one of three sizes. It is available in both standard UK and tropical versions. The machine is mounted on a 300kg slope fronted ice storage bin. 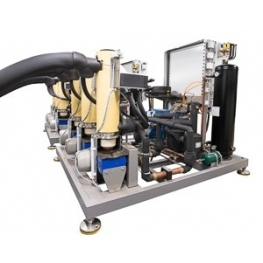 The ZBE 750-SG300 ice machine will be delivered according to CE standards and ready for connection to water power and drain. The Ziegra ZBE 750-S280 makes up to 750kg per 24 hours of flake ice in one of three sizes and stores it in a 280kg capacity slope fronted ice storage bin. The ZBE 750-S280 ice machine will be delivered according to CE standards and ready for connection to water power and drain. 7 day timer: Allows programming of the machine to make ice at specific times of the day or night. The Ziegra UBE 7.500 ice machine makes up to 7,500kg per 24 hours of flake ice in one of three sizes. It is available in both standard UK and tropical versions. The UBE 7.500 ice machine will be delivered according to CE standards and ready for connection to water power and drain. Ice discharge by rigid vertical pipe, level control by light barrier in the bottom of the pipe. Usually used when machine is discharging ice through a wall and feeding a cart below. 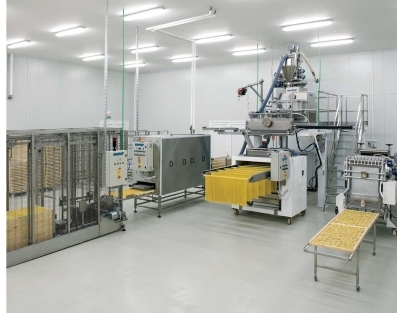 When the machine is to be installed in a hygienic production environment. Frame and panels can be upgraded to stainless steel. Longer legs: To raise the machine to make it easier to clean underneath and to bring the ice outlet to a height suitable for discharging ice into an ice box or cart placed alongside the machine where the standard ice discharge height of 1140mm would not be high enough. Usually paired with an L type ice discharge (see ice discharge options). Refrigeration and controls below ice maker to make a taller unit. Useful when a reduced footprint or higher ice discharge is required. Sterilisation of the incoming water supply by mean of UV filter, all incoming water is passed through a powerful UV field on its way into the machine which kill almost all biohazards in the water supply. 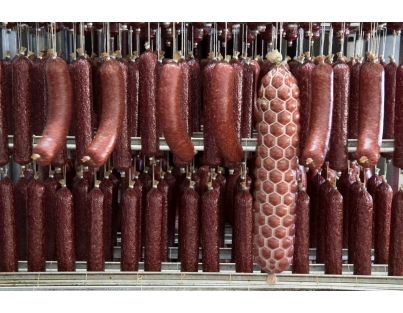 Slows down proliferation of water-borne bacteria inside the machine during operation. 80kg capacity insulated ice cart, moulded from food safe polymer for maximum hygiene. With removeable lid. The Ziegra ZBE 7.500R ice machine makes up to 7,500kg per 24 hours of flake ice in one of three sizes. Including a remote weatherproof condenser as standard, it requires professional installation by Ziegra engineers or other suitably qualified personnel. The ZBE 7.500 R ice machine will be delivered according to CE standards and ready for connection to water power and drain. 5 min. overrun to use the re-evaporation after switch off. 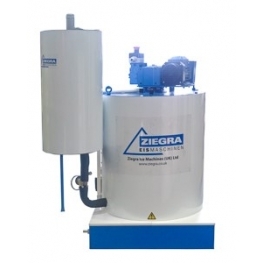 The Ziegra UBE 5.000-2 ice machine makes up to 5,000kg per 24 hours of flake ice in one of three sizes. It is available in both standard UK and tropical versions. The UBE 5.000-2 ice machine will be delivered according to CE standards and ready for connection to water power and drain. 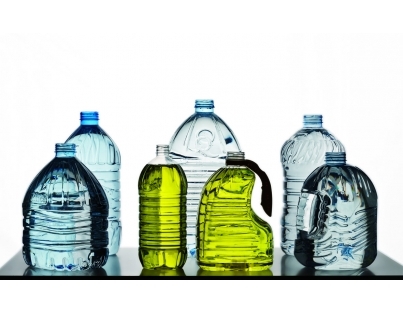 Hygiene plus: CIP Flushing system, or flushing system with disinfection. Enquire for details. 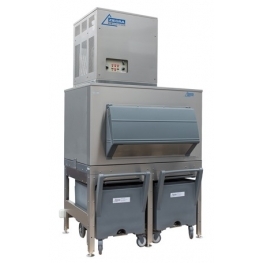 57kg capacity insulated ice cart, moulded from food safe polymer for maximum hygiene. With built in hinged lid. 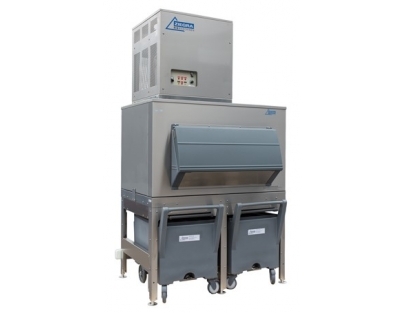 The ZSM 50.000 E is a standalone ice maker only which is designed to be connected to a customers own refrigeration and control system. Scale ice made at 1.6mm thickness.